There’s arguably no foodstuff more American than barbecue, and arguably no pursuit more American than trying to be the best. For these reasons, along with an abiding love of consuming irresponsible amounts of pork and beef, we bring you the best barbecue joint in every state. We polled colleagues, pitmasters, and die-hard smoked meat fans all over the country, incorporating their input along with our own memories of the finest ‘cue to grace our tastebuds to arrive at the must-visit for every single state. In a testament to America’s ever-increasing appreciation for the magic imparted by smoke and low heat, there were tough calls to be made everywhere. Dig in and get ready to update your travel plans. The deal: Myra Grissom and her (now-late) husband opened the restaurant over 30 years ago, coming to the Birmingham area after growing up in Decatur, hometown of Alabama white-sauce legend Big Bob Gibson Bar-B-Q. Though they loved Big Bob's sauce, Myra began tinkering around with her own take on the white sauce, and brought that recipe south down 65 to her now-iconic-in-its-own-right Vestavia Hills restaurant. The move: Though it should go without saying that everyone still loves Big Bob's, Miss Myra's is creeping up on that legendary status thanks in large part to the brick pits custom designed to cook up all sorts of delicious barbecue, but let's be honest, you're going to get the chicken and drown it in that glorious pepper-inflected white sauce. The deal: Barbecue-loving Alaskans may have been a little nervous when longtime owner Harold Groetsema sold his joint to another local 'cue team late last year after running out of energy for the biz, but the local legend with enough pull to draw Guy Fieri and his frosted tips all the way up to frosty Alaska has carried on admirably according to locals. The move: It's not a typo -- the hickory-smoked Arkansas baby backs (Alaska's not much for native barbecue styles) are a much-lauded exercise in pork perfection. That said, it also has a way with brisket if you're feeling beef, including some downright impressive burnt ends. The deal: We first picked this Arizona barbecue darling last year, and wondered if anyone might have the gall to top what is indisputably one of the best Central Texas-style barbecue joints outside of, well, Central Texas. And, upon further inspection, it turns out that gall still remains unclaimed, just as the lines at Little Miss BBQ remain as long as they were a year ago. The move: Go on Thursday. Get the pastrami. And then get the brisket and ribs and everything else. The jalapeño cheddar grits are the best we've had outside of the Deep South as well. The deal: McClard's and its legendary chopped beef remain a locally loved force, but our sources on the ground indicated it hasn't quite lived up to its hype as of late. That's not to say Jones is completely bereft of hype, having received a James Beard "American Classic" designation a few years back, which now hangs humbly in the sparse, smoky dining room. The move: You don't really have much choice. You're getting chopped pork. It's what this place does. But damn does it do it well. All you need is a little of the vinegar-forward sauce, some slaw, and a couple of slices of Wonder Bread to round out the experience. The deal: For the longest time, San Francisco was on the low end of the totem pole when it came to barbecue in California, easily outmuscled by the likes of Phil's in San Diego, Bludso's in LA, and B-Side on the other end of the bridge in Oakland. But in the past few years, SF has seen something of a barbecue (don't say it, don't say it, ah screw it) renaissance, with places like 4505 and Smokestack helping set the table. And now, finally, there is a true California barbecue contender in Black Bark, thanks in large part to chef David Lawrence bringing on a dream team that includes Lance Nicholson from old-school SF BBQ joint Memphis Minnie's as the pitmaster, and Dallas BBQ "guru" Edith Cheadle to consult on recipes and offer up her 20-plus years of Texas BBQ knowledge. The move: Listen very carefully. 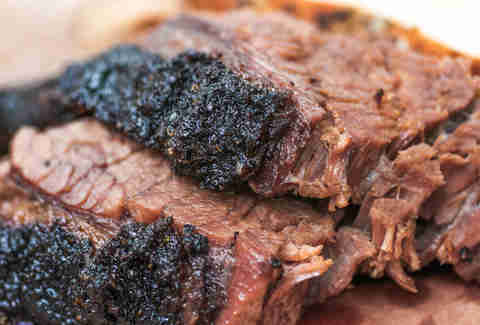 Get a pound of beef brisket. It is some of the most moist and flavorful brisket I've had outside of Texas (and this is coming from someone born in Texas, dammit). You can add a couple of spare ribs, the coleslaw, collards, and sweet potato casserole, but your focus should be on that wonderful, wonderful brisket. The deal: Coloradans have been known to complain about Texas transplants and tourists, but it’s pretty clear they’ll happily make an exception for the Central Texas buddies who took their smoking skills to a shopping center in Denver’s suburbs and started paying homage to their home-state -- you’ll note photos of Texas barbecue legends like Kreuz and Franklin on the walls. The move: While it’s hard to go wrong, if you’re at a place specializing in Central Texas ‘cue and you skip the brisket you’re probably making a huge mistake, especially if they go the extra mile and smoke it 20-plus hours. Which Wayne’s does. The deal: Connecticut is known for a variety of foods: inventing the burger, perfecting the pizza, messing up lobster rolls by making them warm, etc. BBQ has never been high on the list. 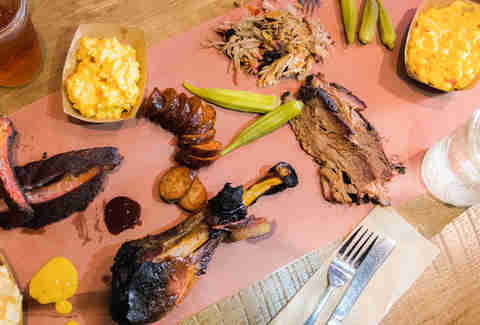 But thanks to Cody Sperry geeking out by going on an obsessive Texas barbecue trip many years ago, then experimenting in his home, then starting a catering business, then finally opening Hoodoo last year, Connecticut's barbecue fortunes have improved vastly. 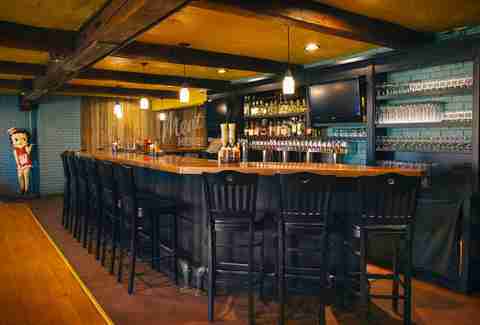 This Ridgefield joint would be a top competitor in any state. The move: Get the Holy Texas Trinity. That brisket -- cooked low and slow for 16 hours on a 2,100lb Lang 108 smoker -- is the truth, but the jalapeño sausage and pork ribs are also worth hitching a ride over the NY/CT border. The deal: Yes, there is a Russell, and his food is of such a quality that he's been known to run out of it at his humble trailer near the railroad tracks where he's developed a devoted following thanks to, yes, the food, but also the kind of gregarious personality that'll make you just a little happier about your impending gluttony. The move: Brisket's only available on Fridays, but truth be told, pork is Russell's strongest protein. Get the pulled pork, pulled to order and sauced with just the right hint of vinegar. Also, as sides go, the smoky, buttery, almost pie-like sweet potatoes are something special. The deal: Since 1957, when Melton Jenkins, Jr. opened the first Jenkins with, as they say, "God, a dream, and $125" (plus a secret sauce recipe from his pops), Jenkins has been keeping the people of Jacksonville sated and sipping cold things to combat that famous hot mustard sauce all over the legendary 'cue cooked up in oak wood-fired pits. The move: The menu is simple. Just get a slab of ribs, a half chicken sandwich, and a six-piece of wings, and I swear you'll be ordering a jug of that sauce to your house. In fact, I literally just ordered one right now. The deal: Married couple Wiley and Janet McCrary had a successful catering business and a boatload of competition barbecue trophies before deciding to showcase their talents at a more permanent brick-and-mortar location in Lowcountry Georgia. Residents of Savannah are quite pleased they made this decision. The move: Both the perfectly barked brisket and the just-tender-enough St. Louis-style ribs have their adherents (pro tip: you can add a few ribs to a sampler plate and miss nothing!). Actually, you're missing a bowl of the hearty, meaty Brunswick stew. Bring friends. The deal: Making it onto our list for the second time, you know the deal here. It is not a take on Southern barbecue. This is Hawaiian BBQ, which happens to be Korean-inflected and delicious, and you’ll get the full Honolulu version of the Soup Nazi if you don't come prepared, so please read the "move" section so you're prepared, otherwise you'll just embarrass us. The move: Walk up to the counter looking very cool and casual. 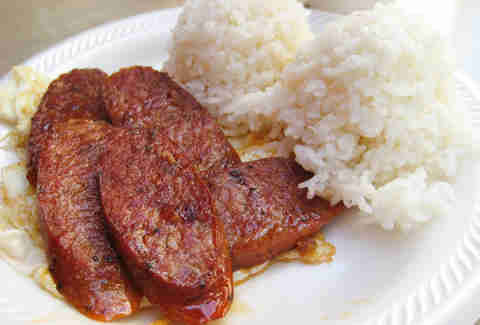 Order the kalbi beef BBQ plate. Pay the lady. Get your food. Eat it and be so very happy. The deal: You may've heard this story before. Man grows up in barbecue-rich environment (in this case, Kansas City). Man moves away from said place and finds that he can't enjoy the simple pleasures of said barbecue. And so he starts doing it on his own. And then catering. And everyone loves it. And pretty soon, he's got his own beloved barbecue restaurant. Well, in this instance, that man is Rib Shack owner Andrew Petrehn and he's got the best damn ribs and burnt ends quite possibly in all of the West. The move: It is the Rib Shack, dammit. You're not here for chicken! (Also, I don't think it has chicken.) You're getting the pork baby backs and praying there are some rib ends or burnt ends left as well. Also, get the smashed potatoes side. As it's put on the menu, "You are in Idaho. Eat potatoes." The deal: Mike Mills is on the short list of America's most celebrated living barbecue legends, having won Memphis in May four times back in the '90s before everyone and their brother seemed to be dabbling in competitive 'cue. He's built something of an empire, including a Vegas outpost, but Southern Illinois remains home, and 17th St remains the standard against which the rest of the state measures itself. The move: The apple and cherry wood-smoked baby backs are objects of obsession for a reason. You could be forgiven for casting some side eye at the notion of a spice rub boastfully dubbed "Magic Dust" -- but after you've had the ribs you'll do no such thing. The deal: Just barely across the Ohio River from Louisville, Shawn's takes its name from owner Shawn Pitts (great 'cue name! 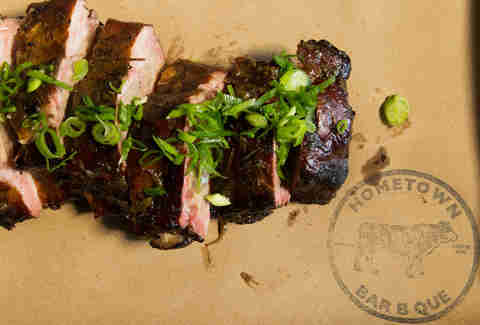 ), who took over the space from a preceding barbecue joint and proceeded to distinguish himself and his smoked meat using generations-old recipes that he learned from relatives during summers in Chapel Hill, TN. The move: The dry-rubbed St. Louis-style ribs are smoked for five hours over a blend of hickory and cherry wood, resulting in a mild yet still pleasantly smoky flavor and just the right amount of resistance before they part from the bone. If you're up for getting your hands a little dirtier, give the deeply flavorful rib tips a shot. The deal: A couple of buddies from Iowa caught the barbecue bug during frequent trips across the border to Kansas City, becoming certified competition judges and, eventually, owners of a barbecue establishment that keeps Hawkeye fans feeling good about life even after crushing losses to FCS schools. The move: The half slab/half chicken combo puts the joint's two standout proteins together in a gloriously gluttonous dynamic duo, though if you like your meats forced together in even closer quarters, the Supreme is a singular sandwich experience that combines pork, turkey, brisket, and your general disregard for nature. The deal: The smoked-meat artist formerly known as Oklahoma Joe's created some waves when its name changed to make more geographical sense. Luckily not much else changed in this old gas station-turned-must-make pilgrimage for barbecue fans the world over. The move: Multiple trips? The ribs here are arguably the reason pigs have ribs (forget "providing structural protection for pig organs"), and you'd be doing yourself a disservice if you ate less than your weight in them. That said, the pulled pork also has its local devotees, and a bit more outside the conventional barbecue box is the Z-Man, a much-lauded sandwich that combines the tender brisket with provolone and onion rings on a kaiser roll. Maybe take a lap and come back? The line will help you digest. The deal: Does barbecue even exist in Kentucky outside of Owensboro? And more importantly, would it matter? Judging by the legendary restaurants (Moonlite was on our list last year) in the town, the answer -- at least to that second question -- is a resounding no. Anyway, Old Hickory has been around for 98 years, all the while in the (now-sixth generation) of the Foreman family, who've been cooking their famous Kentucky-style BBQ mutton low and slow exclusively using hickory wood all the while. The move: You are in goat territory. So stick with the mutton (it's more moist than the chopped version), and for the true experience, add in the mutton ribs, and get a side of burgoo. It's a Kentucky-based stew that you should definitely try once, before getting back to the important business of eating three to four more mutton ribs. The deal: Looking for BBQ in Louisiana is a very quick reminder that you're not quite in "the South" anymore. But Johnson's Boucaniere (that's Cajun for "smokehouse," of course) is an even quicker reassurance that maybe that's a blessing. The Lafayette spot is part old-school vibe, hearkening back to its original role as Johnson's Grocery, a dry-goods and boudin destination since the '30s, and part modern barbecue: owners Lori and Greg Walls opened the 'cue joint in '08, once more flooding the butcher's case with boudin after a three-year closure. The move: Besides that spicy, rice-stuffed boudin, the Walls and their giant smoker specialize in sandwiches that combine either pork, chicken, or brisket with crispy smoked sausages. Get the Campos Special, a combo of brisket and sausage. Then, go get that ice chest you surely remembered in your car and load it up with as much boudin as can fit. You're going to need to eat more. The deal: Here is a secret. When talking to a chef who grew up in Maine and asking him about his favorite barbecue, he asked if he could be anonymous because he didn't want to piss off friends in the industry in Portland. 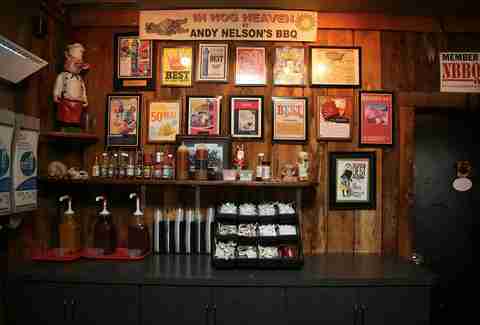 "The real truth of the matter," he said, "is that the best barbecue in the state is in Monson. But please don't tell my friends in Portland." IT'S TOO LATE, ANONYMOUS MAINER!!! But yes, Mike and Kim Witham's formerly tiny, now-giant BBQ restaurant has gone from a tightly guarded secret to a celebrated destination in the last few years, all thanks to generations-old recipes (OK, and maybe a visit from little-known TV person Anthony Bourdain). The move: He (or she! Ah! We'll never tell!!) recommends the pork ribs (which sell out, so get there early) and the beef ribs and really "anything that has a rib in it and can be smoked. Oh, and the beans have some Maine-style maple syrup in them, so get them if you like that, and go to hell if you don't." 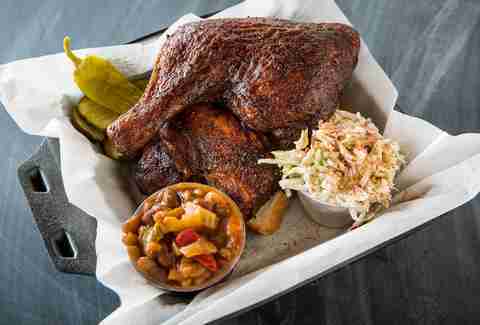 The deal: We keep hearing that there's a BBQ boom afoot in Maryland. And so we thought maybe someone would unseat Andy Nelson's, but with all due respect to the very good Big Bad Wolf's House of Barbeque, Blue Pit, and the underrated Smoking Swine food truck, Andy is still the king (*tries very hard not to quote the "the king stay the king" line from The Wire*). The Alabama-born former Baltimore Colt has been lining people up at his Cockeysville joint for 35 years to taste the hickory-smoked meats coming out of an old gas station. The move: His Bama sauce is good on every single item at the restaurant, but if you choose one, make it the pulled pork. The deal: Being from there, I have a soft spot in my heart for Massachusetts barbecue, be it from Soulfire in Allston, or Sweet Cheeks in the Fenway. But I've never had barbecue anywhere in the Bay State that was better than the Pit Stop in Morton Village, which takes the top Mass spot again for the second year running. The move: Pork ribs. As many pork ribs as you can handle. And then even more banana pudding. I once spilled an entire mess of pudding on my shirt and shamelessly walked right back up and ordered another, because I'd rather look a fool than miss out on that creamy, magical concoction. The deal: Halfway between Detroit and Flint you'll find this small-town barbecue outpost that actually had its initial sights set on wood-fired pizza fame (which it does make, fantastically), before realizing it'd be a shame to leave meat out of this whole wood-and-smoke equation. Michiganders (other Detroit pitmasters included) agree it made a wise choice. The move: The brisket, smoked for 14 hours on green hickory hardwood, reflects a deep appreciation of the art of smoked beef (maybe that's why the place offers a Lockhart, TX sauce -- though this stuff doesn't require any). 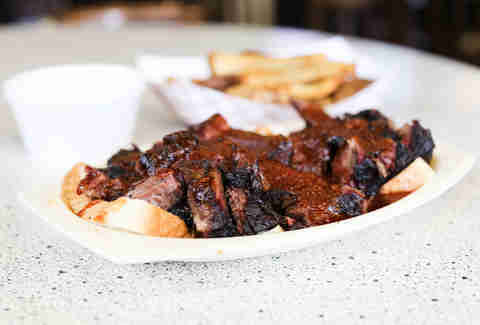 Speaking of beef, if there are any burnt ends available, grab some of those as well. The deal: A trio of friends who came to Minnesota by way of Georgia and Kentucky has been smoking meat together for three decades, at first as a weekend hobby that led to festivals, which led to a beloved St. Paul institution that continues to give the Twin Cities their barbecue fix. The move: The Flintstone beef ribs are simultaneously gloriously charred, shockingly tender, and delightfully excessive. The owners had to develop special racks just to accommodate these hulking achievements in short rib cookery. You'll be glad they did. 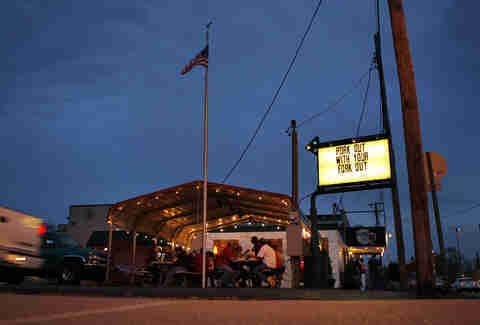 The deal: The Orrison family has become quite a known quantity in barbecue circles, with numerous competition wins (including 2015 Memphis in May) and a short-lived reality show, but fame aside, the original ramshackle home base in Ocean Springs is still Mississippi's go-to for standout barbecue with a side of blues music. The move: You might find yourself tempted to go combo when you start smelling all the smells, but the baby backs are special, and you'd be doing yourself a disservice if you didn't commit to a whole rack with some creamy slaw and some of G-Maw's bacon-backed baked beans. The deal: This joint was opened in 1986 by LC Richardson as his "retirement plan" from his corporate chef gig and now LC the pitmaster is well into his 80s, while LC's the restaurant is entering its third decade as a treasured Kansas City dive that's carved out a name for itself among KC's barbecue greats. The move: While you'll find loyalists to institutions like Arthur Bryant's and Jack Stack among KC barbecue fiends, locals we spoke to have a particular reverence for LC's, and the most effusive praise always centers around one dish: the burnt ends. They're simultaneously crisp and fatty, smoky and juicy -- everything you want out of barbecue in a single bite. Expect to take full advantage of the paper towel rolls at your disposal as you make your way through them. The deal: I came upon Bad Betty's purely by chance. I was in Montana this summer and a friend brought some over to us en route from Helena, and mentally I was like, "This is not going to be very good," because I am pre-judgmental and mostly unimpressed with Montana BBQ in years past, but then Calvin Richards' spot was actually fantastic. Only open for a couple of years from a self-proclaimed "barbecue geek," Richards' resto sort of offers up a fusion of Texas and Kansas City, which usually leads to some problems. In this case, it was merely how do I get more? The deal: Two Lincoln natives got hitched, moved to Kansas, found themselves increasingly obsessed with barbecue, and started hitting the competition circuit as a hobby before heading back to Nebraska and opening their trophy-laden counter-service joint in 2006, serving up -- you guessed it -- Kansas City-style 'cue. The move: The pork ribs (smoked six to eight hours) and the burnt ends are the two items the place is most likely to run out of -- not coincidentally, they're also the two things you want, so get hungry early. In the sides department, the indulgent cheesy potatoes need to be in the picture as well. The deal: Remember the old days of catchy commercial jingles (remember the old days of commercials?!?!) that would stick with you for days? Well, just visit Brothers' site and you will be treated to 30 seconds of a glorious finger-snapping ditty. 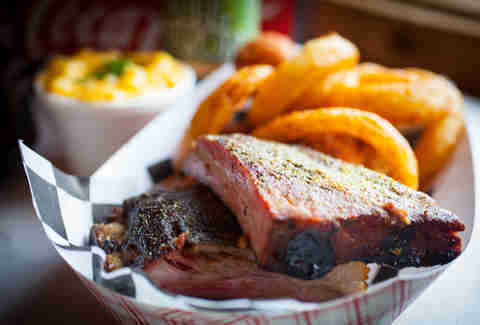 Unlike the glitz of the Vegas joints, which are often second locations from heralded BBQ chefs from elsewhere, Brothers is located in Nevada underdog Reno, and has what one of our editors called "the best damn family-owned barbecue in Nevada, by far" thanks to second-generation family recipes. 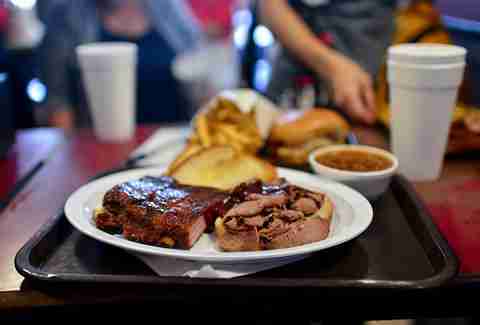 The move: The two-meat BBQ plate featuring pork ribs and spicy smoked sausage. And make damn well sure you get some of the spicy coleslaw on the side. The deal: Once again, the title for the best barbecue in the Granite State goes to Goody Cole's. As one restaurant owner who grew up in New Hampshire put it, "New Hampshire is absolutely a barbecue wasteland, so it's basically Goody Cole's at the top and everyone else down here." Note: he put his hand really low during the "down here" part. The move: If you really want to taste that Oyler smoker working, get the St. Louis-style pork ribs or the hickory-kissed brisket. The deal: Jersey 'cue fans we polled were particularly excited about this relative newcomer to the local smoke scene, a takeout-focused joint tucked away in a small building on a quiet residential street where a former Marine- (get it) turned-brisket obsessive is turning out some serious smoked meat and serving it up wrapped in butcher paper just for you. And for America. The move: The 14-hour-smoked brisket's a must, go for it sandwich-style, layered in thick slices (or chopped if that's more your style) on fluffy bread, and you won't be disappointed. Of course, you might be disappointed that the bread left you without enough room to sample the Duroc pork ribs. And the jalapeño cornbread. The deal: As the saying goes, in the land of green chile, the one barbecue, um, hmmmm. I guess that's not actually a saying. But that doesn't change the fact that Danny's Place (now run by his son Tim) in Carlsbad is our local expert's pick for the second year in a row, thanks to the glory that is consistently great barbecue cooked over sweet hardwood for over 40 years. Oh, and don't worry, because this is New Mexico after all, you can still get a green chile-smothered burrito and the "flip plate" -- a flour tortilla buttered and fried on the grill and filled with a hamburger patty, two cheese slices, green chile, onions, and salsa. The deal: Saying a place has "New York City's best barbecue" may not sound like much when it's surrounded by the murderers' row this story contains, but 1) over the last decade, New York has really started to figure out the form like it has so many cuisines before, and 2) Hometown would be special even if it were in Austin or Kansas City or Owensboro, KY (stop sleeping on Owensboro, man!!) and not a former Red Hook warehouse that seems like a place where Tarantino bad guys would convene after the big job. The move: Pitmaster (and Wayne Mueller apprentice) Billy Durney swings from classically wondrous Texas-style brisket seasoned with just salt and pepper to genre-blurring lamb belly bánh mì with ease and a Yeti hat. New Yorkers are from a lot of places originally, but so long as they love meat, this is everyone's Hometown. The deal: Opened by the actual Red Bridges in 1949 (who himself honed his craft with Carolina 'cue legend Warner Stamey), RB's is still run by Red's daughter today, and remains a shining example of what pit-cooked Carolina barbecue can be. In fact, Thrillist readers dubbed it America's best barbecue earlier this year, and in this case, the wisdom of the crowd proved wise indeed. The move: As much chopped pork as your belly can accommodate. Don't complicate this. 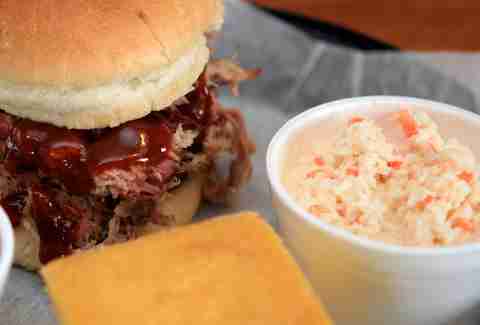 Except with the slaw, which is kind of a must when it comes to Carolina pork. Oh, and if you feel like complicating matters with some of Mama B's pimento cheese as well, that's not a terrible idea. The deal: A much-decorated, still incredibly active competitive barbecue team has used this Fargo haunt as its base of operations since 2007 while still managing to enter a boatload of Kansas City Barbeque Society events all over the country (and win quite a few of them). You'll find it has a more upstanding family-restaurant vibe and a more expansive menu than your typical barbecue spot, but once you sample some, you'll realize the smoky soul's very much in there. The move: The Brisket Supreme takes the lauded brisket and layers on crispy onion straws and provolone, all held together with a house-baked bun. Kind of sounds like a certain sandwich out of Kansas, but hey, there are worse sandwiches in the world to emulate, right? The deal: Oklahoma is a peculiar place for barbecue, in that it happens to reside squarely in the South, but usually stays out of the barbecue conversation (possibly because everyone is so enamored by fried onion burgers). But visiting the legendary Leo's in OKC -- which has been serving damn good BBQ for over 40 years -- a couple of months ago made me start to wonder if everyone is just keeping quiet on purpose to keep the tourists out. 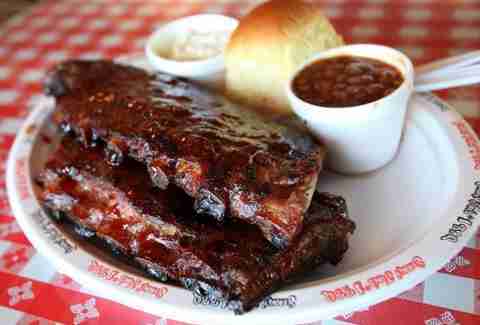 The move: A full rack of ribs. And strawberry banana cake. In that order. The deal: Portland's in the midst of a BBQ boom (of course it is), with rising stars like People's Pig, Smokehouse Tavern, and cart-based Matt's getting national attention. Maybe soon they’ll catch up to the scene's OG pitmaster Rodney Muirhead, whose salt-and-pepper, hardwood oak-smoked brisket is the closest to Texas you're gonna get in the PNW. It's the consistency of butter, and a thing of simple beauty, so much so that even as dishes like smoked fried chicken make a play for the city's throne, its simple perfection reigns supreme. The move: It's tempting to stray from the brisket for other Central Texas fare, but you don't really have to with the Pit Boss, which pairs 1/4lb of that bark-covered gold with spicy pulled pork, a hot link, and ribs. If you're feeling extra frisky, get the smoked trout on the side. And don't overlook the queso-soaked brisket tacos at the sister Tex-Mex bar, La Taq, next door. Queso is dessert, right? The deal: So here's the thing about BBQ Bob's. It isn't a restaurant, per se. But we're breaking the rules here because -- in our journeys through Pennsylvania -- by far the best barbecue in the state happens to be coming out of a small catering business north of Philadelphia run by Bob Trudnak, who goes by the name BBQ Guru on the competition circuit. Bob got a little press when his ribs won the World Food Championships in Vegas, but the fact that this man is still just slinging barbecue at office buildings and birthday parties around Montgomery County is a damn shame. Open a restaurant, Bob! Pennsylvania demands it. The move: Both the St. Louis-style ribs and the pulled pork are must-orders, as are the ABTs, which stand for Atomic Buffalo Turds and actually consist of jalapeño peppers stuffed with cream cheese and pulled pork and wrapped in bacon. Life-changing. OPEN A RESTAURANT ALREADY. The deal: Let's be honest for a second. The Preppy Pig logo, with its Vineyard Vines-esque bright colors that make it look like a pig wearing an argyle sock, gave us some serious pause. But here's another honest fact: Patrick DeSocio has been making the best barbecue in Rhode Island for many, many years, but it took him finally moving from catering to an actual restaurant to solidify that fact. His "Rhode Island-style" barbecue (a little Portuguese chourico in there, some local fish specials, etc.) is inarguably the best you can get on Del's Frozen Lemonade's home turf and it's not even close. But dammit Patrick, did you really have to call it the "Preppy Pig"? The move: The Lil' Rhody. 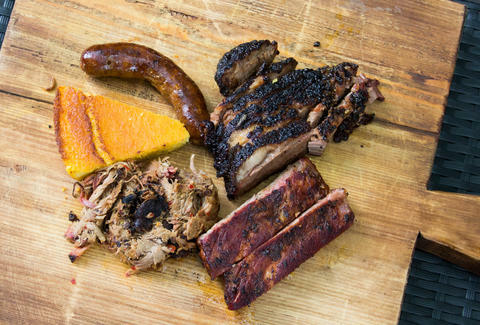 It's for four people, but it gives you every damn thing you'll want on Patrick's menu, from the pork ribs and brisket to the hot links and jalapeño cornbread. Oh, also throw in some burnt-end baked beans. The half-order goes a long way. The deal: A cookhouse fire put this Carolina legend out of commission for a while a few years ago, but owner Rodney Scott (who started smoking whole hogs at age 11 under the guidance of his parents) took to the road to raise money for repairs, and Scott's got back to welcoming pork-hungry visitors from near and far Wednesday through Saturday, the way it was meant to be. The move: Get a pulled pork plate with a side of skins off the hog and you'll understand the reason pigs were put on this Earth in the first place. Throw in some boiled peanuts because you're in the South and hopefully not allergic. The deal: For the second straight year, Rowdy Hog gets the SD nod, not only because of its ridiculously delicious and tender award-sweeping ribs smoked on a "special blend of wood" for six hours and the "Slop Top" pulled pork and coleslaw sandwiches, but also -- actually, that's pretty much exactly why. The move: If you've got one choice, the half-rack of ribs with a side of that heavenly smoke sauce and some bread pudding is what you'll want to dance with. The deal: Barbecue in Memphis is beyond competitive, and other local standouts like Rendezvous and Central certainly have their adherents, but area barbecue junkies seem to have a special reverence for Payne's, where family matriarch Flora has been expertly wielding her cleaver for more than three decades, much to the delight of anyone seeking chopped pork perfection. The move: See the above about that pork -- get yourself a massive sandwich laden with the spicy, vinegary sauce and the notoriously bright-yellow, almost relish-like slaw and prepare to implement a fork halfway through when the bun begins to vanish, because you're going to treasure every tiny scrap. The deal: Picking a Texas place is always the most difficult part of this story, as Texas spots alone could probably sweep 40 states if they'd just spread themselves out around the country. With that said (and no disrespect to Franklin, or Kreuz in Lockhart, or Louie Mueller in Taylor (our pick last time), or Pecan Lodge and Lockhart Smokehouse in Dallas, or Snow's in Lexington, or Cooper's in Llano, or Meshack's in Garland, or Leon's in Galveston, and on and on), our choice for the best in the state is Mueller's granddaughter's Austin place, La Barbecue. Last year, I did one of those BBQ pilgrimages into Lockhart, up through Dallas, and around the state, and when I came back around to Austin, the brisket I got from LeAnn Mueller and pitmaster John Lewis (formerly of Franklin) at La Barbecue blew away almost everyone else with such ferocity it was actually staggering. Lewis is a barbecue wizard and Mueller is barbecue royalty. That unbeatable combination is bad news for everyone else. The move: Excuse the hyperbole, but if you don't try the brisket, the beef ribs, and the sausage, you are a damn fool. A DAMN FOOL. The deal: You know the story by now. Backyard barbecue enthusiasts get into competitive barbecue, then get REALLY good at it, then get themselves a brick-and-mortar space so they can spread their smoky achievements to more than just picky judges. They use the exact same recipes here as they do when they're vying for a trophy -- which can't be said of all establishments, unfortunately. 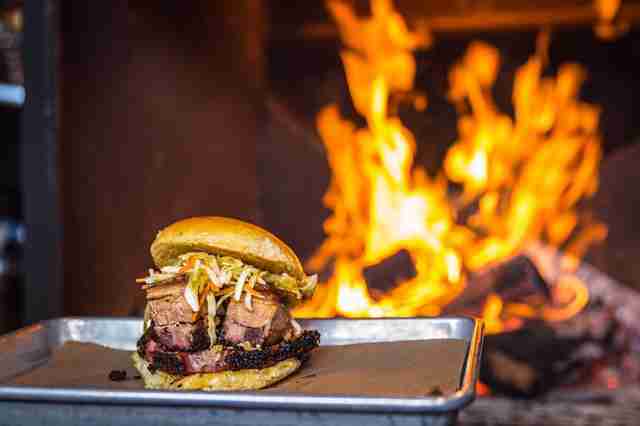 The move: The brisket will satisfy even the pickiest beef purist, but if you're less of a purist, there's a certain pulled pork- and smoked sausage-laden burger called the Caveman you just might be interested in. The deal: Perhaps surprisingly for a New England state known more for cheese, ice cream, and jam bands, Vermont has quite a few killer barbecue choices, but we've once again gone with my favorite, Bluebird, mostly because I can't seem to stop thinking about the maple-barbecue mop for those damn spare ribs and that cider-brined shaved turkey, and I don't even really like turkey. The deal: Craig and Donna Hartman are Culinary Institute of America grads, but don't let the fine-dining pedigree fool you -- this is serious barbecue that can hold its own with anyone's. Virginia's not as much of a barbecue destination as some of its Southern neighbors, so there's a bit of style-borrowing from other states, but each one is given its proper due. 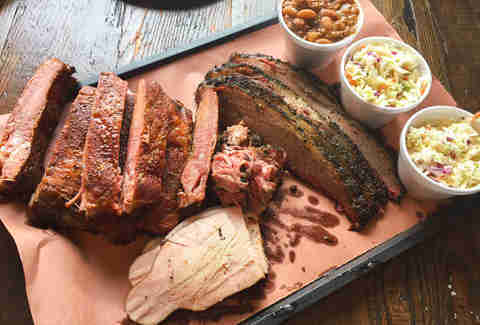 The move: You may find yourself overwhelmed with options, but opt for the two-meat platter and fill it with juicy pulled pork and tender ribs that've had a nice slow stint over hickory in a custom smoker known as the Beast. Although, the meat is more Beauty. Sorry. The deal: Outside of the South, barbecue styles can be tough. Merely practicing another state's style of 'cue can get you called an imitator, while doing something innovative gets docked by the purists. You can't win either way so I guess the lesson is you should just quit and stay at home writing disparaging political messages under people's pictures of their children on Facebook. Unless you happen to make something so delicious that everyone just shuts up and eats, like they do at Bitterroot in Ballard, which serves up "Northwest BBQ," which, to me, just tastes like barbecue done really well. The move: The pulled pork sandwich on that Tall Grass Bakery pretzel roll is essential, followed by house-cured and -smoked pork belly and those addictive pink pickled deviled eggs. And screw it, if you're there for dinner, just scrap all of that and get the smoked pork shank (or, you know, add it to the mix). The deal: Yes, the Jane Lew barbecue legend is our pick yet again. Yes, we still haven't gotten over the hickory wood-smoked pork and those pickles that are spicy and sweet and the perfect acid to play up against that hickory flavor. No, there isn't a better-named town in the country than Jane Lew. The deal: The namesake of the biggest name in Wisconsin 'cue got his start as a youngster helping his dad tend to the charcoal BBQ out back, sparking a lifelong obsession with smoked meat that's led to a much-celebrated secret sauce, numerous competition awards, and 20-plus years of Wisconsin meat sweats. The move: The ribs are the unquestioned king of the meat mountain here, with the just-tender-enough meat balanced perfectly by that aforementioned sauce, which Jon started developing at the ripe young age of 18. The deal: There's no shortage of reasons to visit Jackson Hole, what with it's proximity to world-class skiing and Yellowstone, but don't leave out Bubba's when you're making that list. If you have a full day ahead of you and need your protein fix early, fear not, brisket hash is available at breakfast. The move: That brisket? Yeah, it's still moist and peppery at conventional barbecue-eating times, too. If you want to taste a little more of the magic that results from its 12-plus-hour stint in the smoker, get some of the baked beans studded with burnt ends. Kevin Alexander is Thrillist’s national writer-at-large. When he’s not thinking about barbecue he’s thinking about burgers. Or his favorite old Babysitter’s Club plotlines. Ask him about all of it @KAlexander03. Matt Lynch is Thrillist’s executive editor who is convinced he’d overdose on brisket if he ever lived in Texas. Luckily in Chicago he only overdoes it occasionally. Follow him @MLynchChi.